​The Subscriptions functionality allows a user to unlock additional functionalities for Project Plan 365 for Web, to better match his project planning needs. In this sense, a user has the possibility to start a free trial for Project Plan 365 for Web in either Advanced Viewer or Complete Editor mode, or to buy a subscription for Advanced Viewer or Complete Editor for Project Plan 365 for Web. Thus, the user can either has a trial or paid subscription for Advanced View-Only or Complete Editor mode of Project Plan 365 for Web. 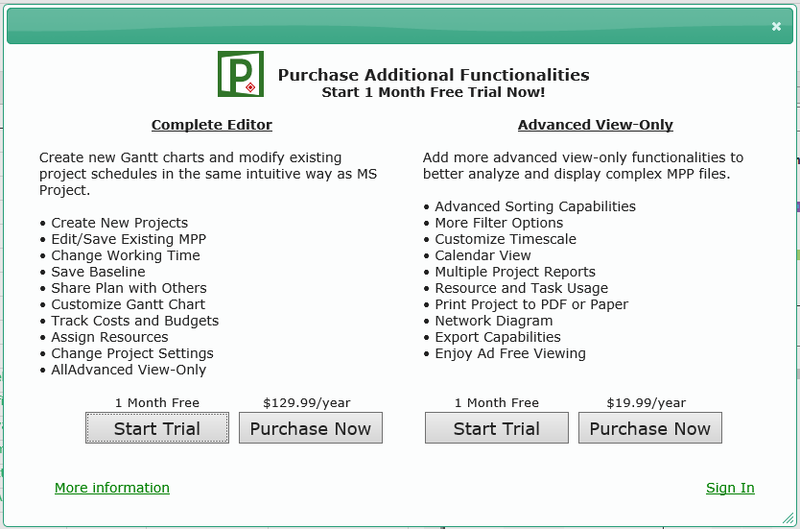 Based on the type of subscription the user has purchased, the application can be in either Advanced View-Only or Complete Editor mode. 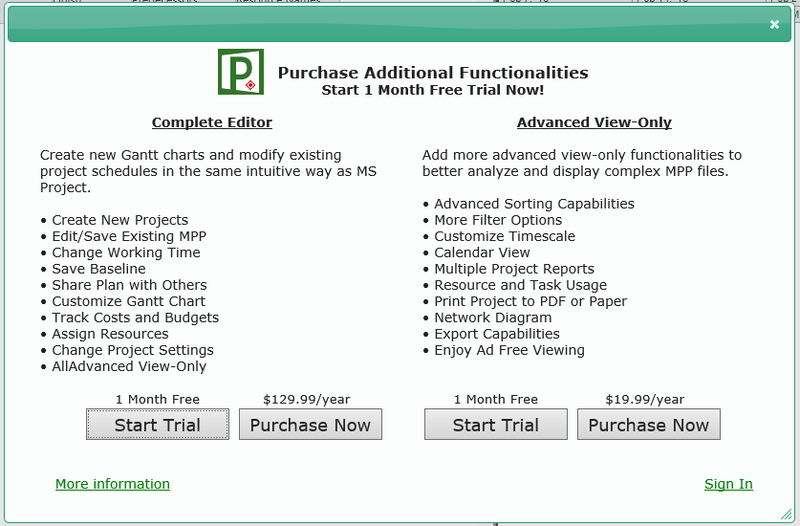 Therefore, there are four types of available subscriptions: free trial (for Advanced View-Only and Complete Editor mode), and paid (for Advanced View-Only and Complete Editor mode). Each subscription, whether it is of free trial or paid mode, has associated a start and end date, which dictates the moment in time when a subscription may expire. A free trial subscription has a period of 30 days, whilst a paid subscription lasts one year, and it can be renewed annually. Thus, the status of a subscription can be either active or expired. 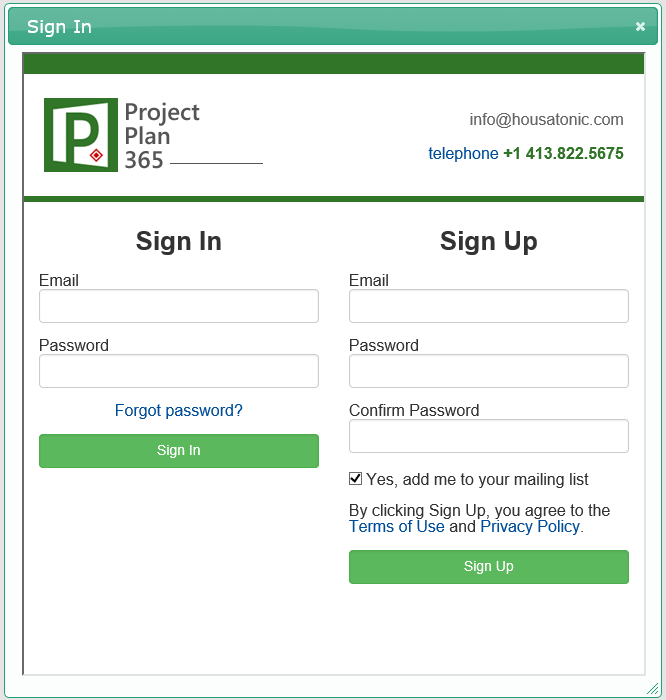 Please note that in order to start a trial or to buy a subscription, a user needs to have an account on www.projectplan365.com website, and it is required to sign in with his account within Project Plan 365 for Web. At the first time when opening the application, when the user has not signed in or when his account is not associated with any subscription, Project Plan 365 for Web is in Free Viewer mode. In this case, the application is locked and most of its functionalities cannot be accessed. Once a user started a trial, he can no longer start another trial. To start another trial, you must Sign Out and use another account to sign in the application. The subscription functionality brings the concept of universal platform subscription (UPS), such that once a user purchased a subscription for Project Plan 365, he can use it across several platforms on which Project Plan 365 is available such as: Windows, Mac, iOS (tablet and phone), Android (tablet and phone). Therefore, the user does not need to purchase multiple subscriptions in order to use Project Plan 365 application on different platforms. At this webpage, it can be found a list of functionalities that are available in Project Plan in Free mode, in Advanced Viewer mode and in Complete Editor mode. In the following it will be described the possible scenarios that may arise as part of the UPS flow. 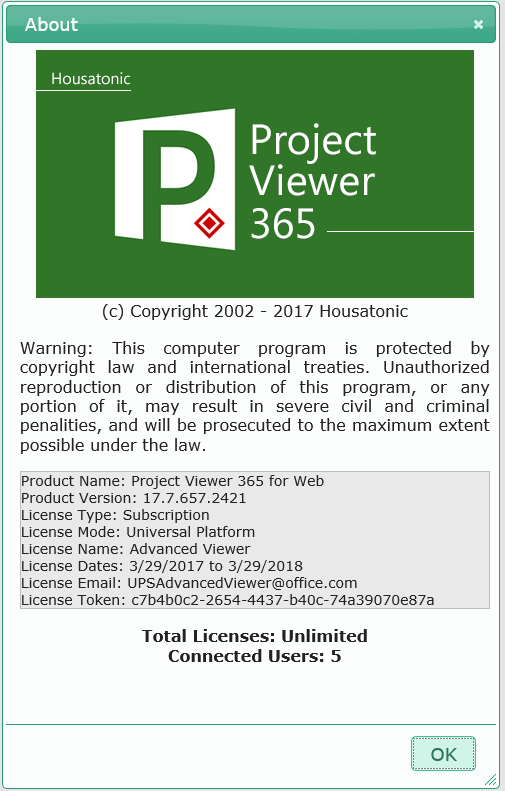 At the beginning, when no trial was started or no subscription was bought, Project Plan 365 for Web is in Free Viewer mode, and most of the functionalities cannot be accessed (i.e. a lock indicator will be shown next to the functionalities that are not available in Free Viewer mode). Also in Free Viewer mode, a banner will be displayed at the bottom of the page. Pressing on "click here" text will show the previously Purchase dialog. 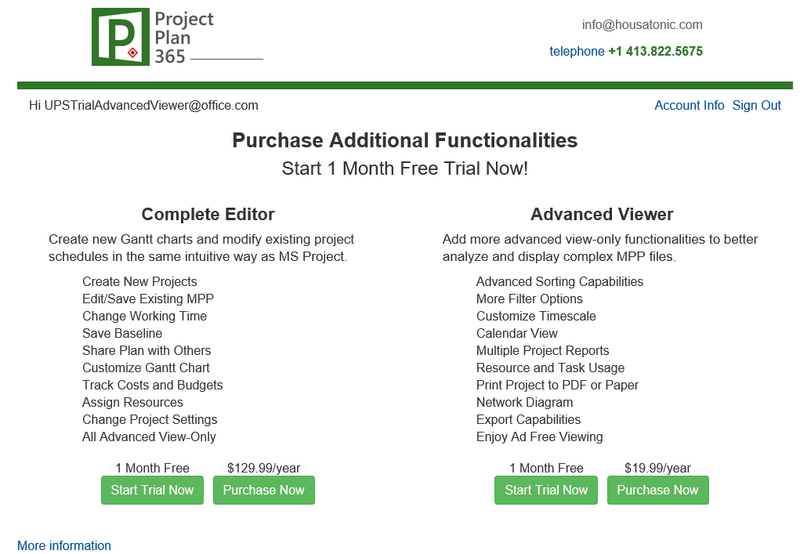 You can use Project Plan 365 for Web in Advanced View-Only mode either by starting a trial for Advanced View-Only, or by purchasing a subscription for Advanced View-Only. To achieve this, you must sign in the application with an account. 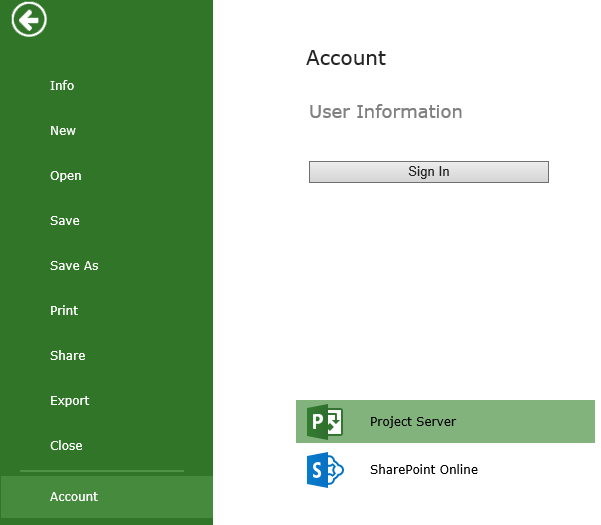 A user can sign in Project Plan 365 for Web either by using the top right button within the application, or by heading to the File backstage menu -> Account menu and press here on Sign In. Pressing on Buy Button, displayed in the above notification, will open a webpage on projectplan365.com website, where the user can purchase a subscription. This Purchase webpage is similar with the Purchase dialog. 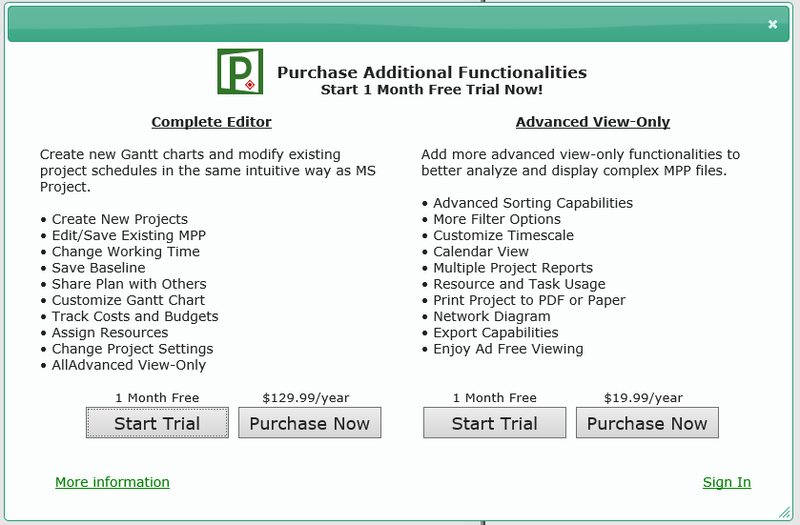 To start a trial for Advanced View-Only mode using the Purchase dialog, press on Start Trial button under the Advanced View-Only column. 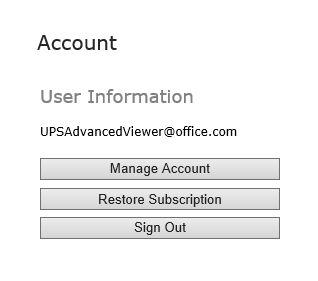 A confirmation dialog notifies the user that an Advanced Viewer Universal Platform Trial Subscription was started. The same purchase option is available in the Account menu from backstage. If pressing on Purchase button, the user will be directed to the same webpage as the above one. 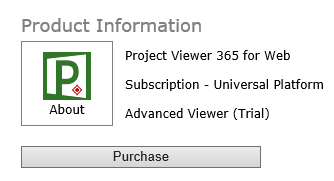 To purchase an Advanced Viewer Universal Platform Subscription, in the Purchase dialog press on Purchase Now button. Please note that to purchase a subscription, you must sign in the application. As you can notice, the subscription is available for one year, with the option to annually renew it after it expires. Once you've done this, you will notice that the application is unlocked, in case there was no previously subscription associated with the account.